To most people, an ant is just an ant. You probably know what a fire ant is, and you’re aware that there can be huge ants or tiny ones, but you likely don’t know the various types of ants or what the differences are between the different ant species. Because of this, it can be difficult, if not impossible, to figure out how to get rid of ants that invade your home. But when you call Eco Tech, our professional natural pest control experts will help you rid your Minnesota home of whatever type of ants have made your house their home. While most people have no reason to know the difference between ant species, it can be a crucial component in determining how to most effectively and quickly eliminate a hoard of ants that’s taken over your home. Our ant exterminators have spent years working in pest control, and they’ve come to know not only the different types of ants but also their habits. Using this knowledge, we are able to determine the best pest control treatment to use on whatever type of ant you’re struggling to get rid of. 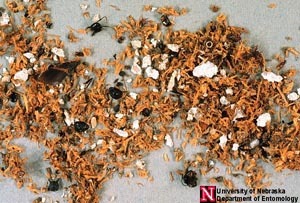 With more than 50 years of collective pest control experience and over 15 years servicing the Twin Cities area, our expert ant exterminators have the skillsets and understanding of ants to have created and effectively utilize our own natural pest control treatments, alternatives to traditional treatment solutions. Our treatments are organic and less toxic than the chemical-based solutions you’d find in stores, making them environmentally friendly and safe for you, your children, and even your pets. Although we recommend our own products for homeowners who want to remain in their homes while our exterminators work their magic, we do provide the more traditional options as well. Because we know that the only way to make sure all of our customers are completely satisfied with our professional ant exterminators, we make a point to do the best we can every time we take a job. Promising to help you reclaim your home, we believe that the only way to be satisfied with our own business is to make good on that promise without any strings attached. That’s why we offer our services without requiring long-term contracts. Without the worry of a contract, you can make sure you’re getting the best price for our services without worrying about being charged more later, as some pest control businesses often try to do. Without long-term contracts, you can feel certain that we don’t just want your business; we want to help you. For help getting rid of the ants that have taken over your home, look to Eco Tech for a reliable, honest, and environmentally friendly pest control business. Our priority is making your home livable, and we’ll do that whether we’re using our own products or the name brand treatments, and with no contractual strings attached. Call our 24-hour service number for emergency help at 763-232-7296, or call any of our other numbers, 612-237-8282, 651-633-8600, 952-881-6662, 763-785-1414, to schedule an appointment.